I got a food processor! I can’t believe I never had one before. I feel a little guilty for feeling like I needed one because we already have a Vitamix. It’s an awesome kitchen tool, though. It makes food prep a breeze. 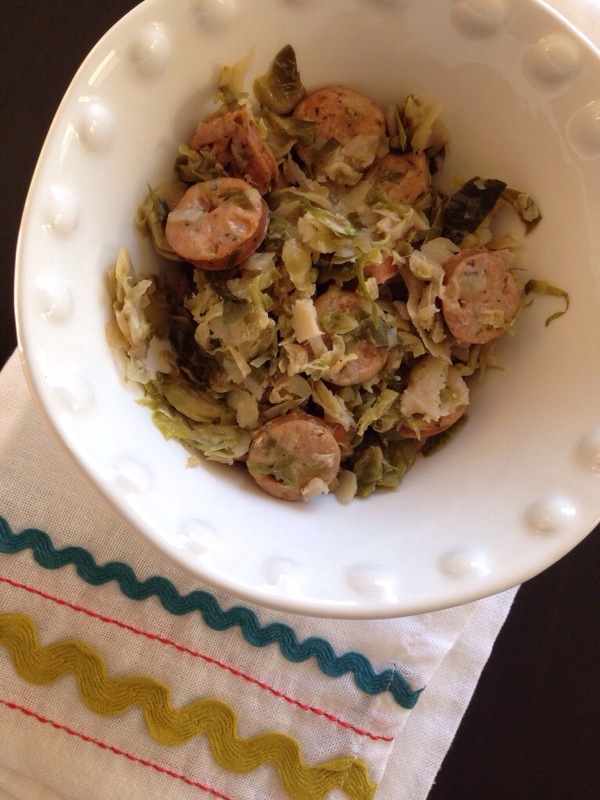 For this recipe, I was able to shred 2 pounds of raw Brussels sprouts in just two batches. The whole process of setting it up, shredding the brussels, and cleaning the machine took less than 5 minutes. The original recipe comes from PaleOMG.com; this version is a little modified. All the recipes I’ve tried by Juli have been amazing, and this one is no exception! 1. Heat coconut oil in a dutch oven or large stockpot. Add the diced onions and cook over medium heat for about 3 minutes, until they begin to caramelize and soften. Add the garlic and cook for 30 seconds more. 2. 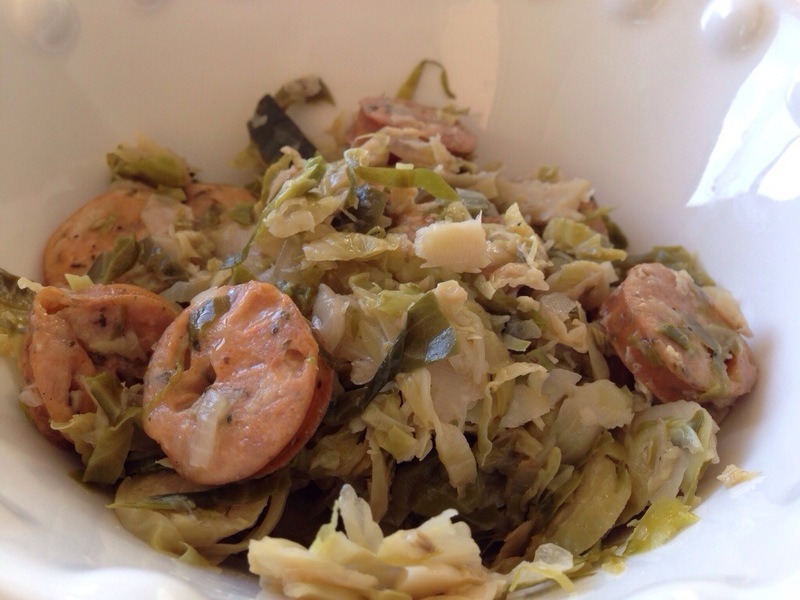 Add the shredded Brussels sprouts, sliced sausage, and apple cider vinegar. Stir in until the brussels begin to wilt down. Cover the dutch oven or stockpot and reduce heat to low. Simmer for 15 minutes or until the brussels shreds are tender. 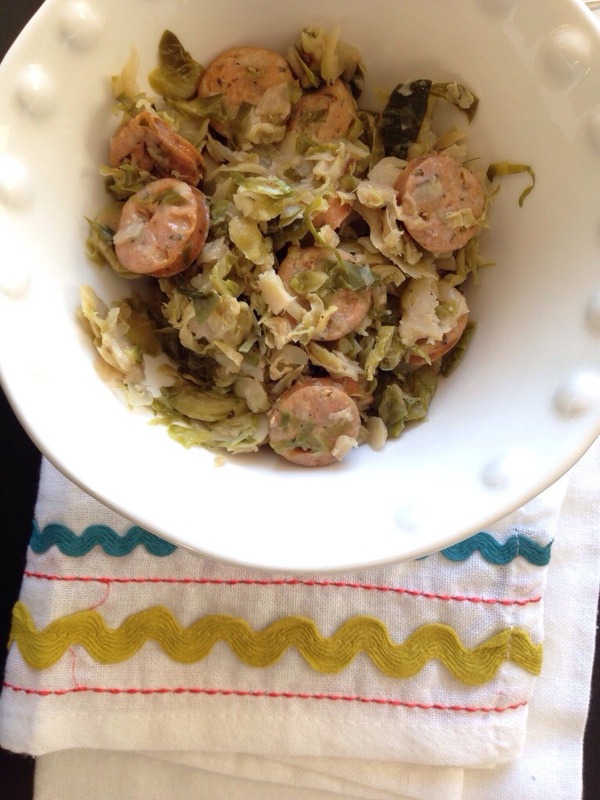 I love that this recipe is easy to make and super flavorful thanks to the addition of sausage. Enjoy!